2016 Issue available online to members. 2016 PRICE (unless otherwise indicated) - $12 each members and $15 each non-members if purchased in person; $16.50 each members and $19.50 each non-members if mailed. All prices in US Dollars (USD). 2016, Volume 33: 4 Issues in 1! Vet Referrals. New Stud Names. Handmade Polymer Clay Figurines; Other Crafts. Letters. Largest Collection. Building A Better Rat. AFRMA Display–2016 Butterfly Day. Beginners’ Corner–Mouse Ear Notches. Colors & Coats–What Causes Tummy Spots on Rats; Banded Mouse With Spot. Shows & More–Rats Show Quality? ; Domesticate Black Rat; Judging Mice; Pedigrees To Show? Medical–Mycoplasma Pulmonis Update? Colors & Coats–Color Carrier Indicator. AFRMA Display–2016 America’s Family Pet Expo. Colors & Coats–Rat Coat Mystery: Velveteen? Helpful Hints–Rubber Band To Hold Water Bottle In Place. Beginners’ Corner–Rat Ear Tags. Breeding & Stuff–Keeping Pregnant Mice Together; Signs of Labor In Mouse; Mouse Get Pregnant When Not In Heat? Colors & Coats–Determining Rat Colors and Breeds; Chocolate? and Beige? Rats; Need ID on Australian Rat. Color Me page. AFRMA Display–2016 Duck Daze. Colors & Coats–Outcome of Mouse Breeding. Shows & More–Becoming An Affiliated Club. Beginners’ Corner–Overseas Nutrition; Needs Quality Food; Healthy Treats. Colors & Coats–Blue-Beige? Rat. Homey Rats. Breeding & Stuff–Trouble Getting Rats Bred; Gray Rats Not Breeding; Pregnant Rat Lactating. Memory Drug. Colors & Coats–Facebook Notes: ID Rat Colors: Blues. Medical–Sore On Mouse; Bare Patch On Mouse. Colors & Coats–Hairless, Tailless & Dumbo Information Needed; Breeding Dumbo, Tailless & Hairless Rats; Housing Tailless. Ear Mange In Wild Rats. Rat Fleas Exterminate Native Species. Beginners’ Corner–Fleas On Rats. Critter Critiques–SmartStraw™ Bedding Review. Smoking and Pets. Colors & Coats–Variegated vs. Spotted Mice. Book Review–Rats: A Complete Pet Owner’s Manual. Helpful Hints–Coconut Oil Drops; Olive Oil To Clean Male Hairless Rats. Stress Alters Genes. Colors & Coats–Difference Between Himalayan & Siamese Rats; Marked Siamese. Beginners’ Corner–Gambian Pouched Rats. Breeding & Stuff–Big Dead Rat Babies. Colors & Coats– Brownish Lilac or Cinnamon Rat? ; Lilac Mouse; Lilac or Cocoa Rat? 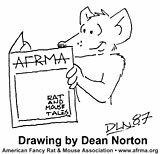 Shows & More–Video of Rat Judging? London Black Death: Humans To Blame. Mouse Grimace Scale. 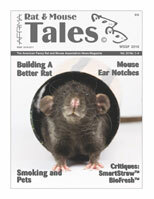 Rats and Mice Around the World–Queensland Rodent Fanciers (QRF) (Australia). Colors & Coats–Documenting Odd-Eye Rats. Color Me page. Beginners’ Corner–Light Sensitivity. Medical–When To Euthanize. Breeders’ Pet Selling Guidelines. Colors & Coats–History of Champagne Rats. Helpful Hints–Quick & Easy Water Bottle Holder. Breeding & Stuff–Raising A Fuzzy Mouse. Shows & More–Newest Unstandardized Rat: Silver Russian Dove; Newest Standardized Rat: B.E. Siamese. Beginners’ Corner–Chewing Fleece; Breed Chewing Out. Colors & Coats–Tortoiseshell Rat. Critter Critiques–BioFresh™ Performance and Performance Plus Bedding Review. Medical–Mouse With Runny Eye. Colors & Coats–Russian Blue Burmese Color Help Needed. AFRMA Display–2016 4-H Pet & Science Symposium. Colors & Coats–Agouti or Cinnamon Rat. New Manus Island Rat. Dim Night Light. Beginners’ Corner–Therapy Rats. Colors & Coats–Genetics Question: Breeding Rex Rats; Rat With Very Short, Soft Coat; Babies With Long Whiskers. Breeding & Stuff–Genetic Testing. Shows & More–Change Rattery Name; First Rat Classes. Spottie Guy Award: AFRMA Pet of the Year 2016. Colors & Coats–Update On New Rat Colors: D’Argent, Spotted Tabby, Siamese Sable, Sable, Harlequin, Marten. Beginners’ Corner–Bloated Rats. Keeping Young Male Mice from Fighting. Color Me page. Highlights from the 2016 Board Meetings. Breeder’s Directory. AFRMA Web News. Show Reports. 2016 Mouse Challenge Trophy Winners. 2016 Rat Challenge Trophy Winners. Breeder Of The Year Award Totals For 2016 Rat. Breeder Of The Year Award Totals For 2016 Mouse. Club Listings For Show Locations; Looking For Breeders Near You; Looking For Rescues Near You; Starting A Club; AFRMA Shows In Other Locations.